In high school, I can remember the bumper sticker that became popular, “Real Men Eat Quiche.” Well, it’s a good thing I am raising some real men, or they might go awfully hungry. Summary: This quick and easy quiche recipe whips up in minutes, but is so delicious you’ll definitely want to double the recipe. 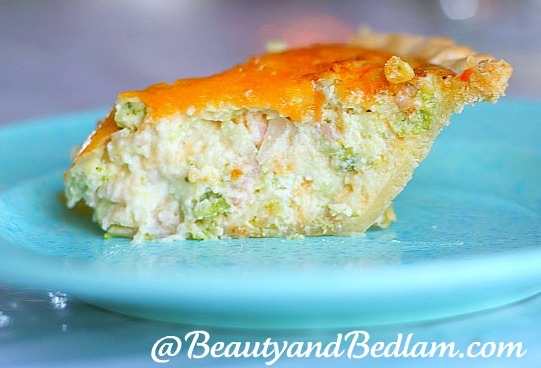 Sprinkle your choice of cheese and meat on the bottom of pie plate. Mix the remaining ingredients together and pour on the top. Yes, cheese is my downfall, so often, I sprinkle additional cheese on top. Bake at 350 degrees for 25-30 minutes. Let stand a few minutes to set before cutting. This recipe is just as delicious with your choice of vegetables as well. I typically add finely chopped onion, broccoli and even potatoes, but peppers, mushrooms, green onions are all wonderful choices as well. This looks similar to our favorite quiche recipe. And if you are concerned about using Bisquick you can use this recipe to make your own- it works fabulously! I make a Salmon Quiche that we love. Mix together 1/4 chopped green onions, 1 1/4 cup evaporated milk, 4 eggs beaten, 1 can salmon, 1 cup swiss cheese and 1 cup cheddar cheese. Pour into unbaked pie shell and bake at 375 for 35-40 min. Of course you could add veggies to this recipe. I serve it with a salad and dinner is ready. Cool thanks, this is what for dinner! I made this for a party we were having and it was a huge hit. I used a mix of cheddar and parm cheeses, some herb d’provence and a bit of all purpose seasoning powder from Badia. I added some mushrooms and smoked sausage along with bacon and the salt was ideal. YAY! So glad to hear that and what wonderful additions you put in. That is the best part about this. You can dress it up how ever you want. Looks delicious!! 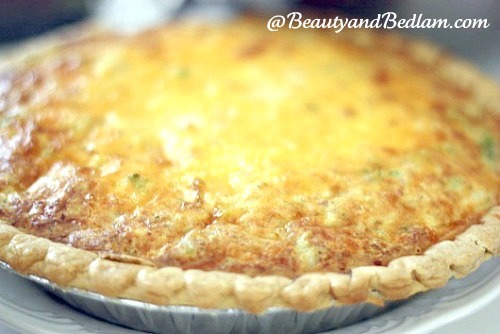 When you add veggies to this quiche, do you add about the same amount as the meat? Thanks for sharing, can’t wait to make this this weekend!! !